A conservation planning meeting with the local NRCS representative. Photo courtesy of NRCD. 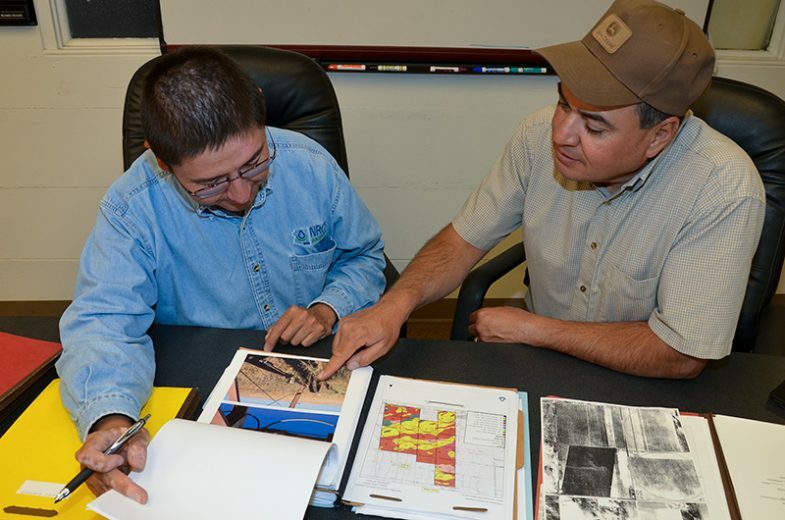 Natural Resource Conservation Districts (NRCDs) are local units of government charged with carrying out conservation activities to support local communities. These activities include soil conservation efforts, promoting forest health projects, urban agriculture, protection of water quality and quantity, and projects that address invasive species and support wildlife. NRCDs are supported by the USDA’s Natural Resource Conservation Service, which is a program that provides support, in the form of technical assistance, funding, and other tools and resources, to farmers, ranchers, and forest managers throughout the U.S. NRCDs also receive funding assistance from the Department of Interior and the EPA, often through discretionary conservation program funding. The Farm Bill, an annual federal appropriation made to support farming and agriculture, is an important source of funding for NRCD programs. The Farm Bill includes a number of voluntary conservation programs, which fund numerous efforts undertaken by NRCDs throughout the country such as the following: preservation of soil health and water quality; wildlife protection; and other projects designed to improve the productivity of working landscapes, such as farms, forests, and grasslands. The Verde NRCD conducts classroom and field environmental education for a range of audiences, primarily school-age children, and also provides landowner education and support for protection of soil and water to ensure long-term productivity of the land. The long-term goals of the Verde NRCD are to improve water availability for local agriculture, preserve the region’s agricultural heritage, and improve fish and wildlife habitat in the area. To learn more about the Verde NRCD, visit its web site here. To learn more about NRCD’s and their programs throughout the U.S., visit the National Association of Conservation Districts at their web site here.